1977 was quite a year. The first Apple Computer went on sale. The average cost of gas was 65 cents a gallon. A bikini cost $9. In Plantation, Florida, a young entrepreneur by the name of David Perlman became the president and owner of A&M Tape & Packaging, a wholesale distributor of cardboard boxes and other packaging and shipment supplies. This year, A&M Tape & Packaging celebrates 40 years of providing innovative packaging solutions to customer in throughout the U.S. and abroad. A&M Tape & Packaging started with seven employees and lots of brown cardboard boxes and shipment supplies. The company moved its headquarters in the early 1990s to a 90,000 square-foot warehouse facility and showroom in Sunrise, Florida. To further expand the business and respond to online shopping trends, it launched the e-commerce site, MRBOXonline.com, in 2005. Perlman credits A&M Tape & Packaging’s steady growth and loyal customer base to a “keep it simple”’ business approach. “We listen to our customers and offer innovative solutions to meet their business needs,” he explained. 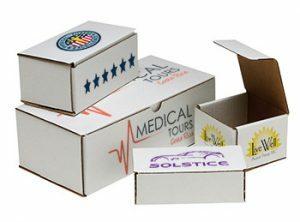 For example, after recognizing a demand among his small-business customer base to customize shipment boxes and packaging tape, Perlman launched onsite high-digital printing services that allowed for low-run printing with high-quality results. When customers requested a whisper-quiet alternative to packaging tape that creates a screeching sound when pulled by hand or through a dispenser gun, A&M Tape & Packaging introduced Lucky Dog Silent™ to its Lucky Dog™ Brand product line. We stock five million cardboard boxes (certified as made-in-America) in 1,000-plus sizes at its warehouse, plus corrugated mailers, stretch wrappers, wine/beer shippers, and assorted office supplies. Amidst the stacks of cardboard boxes are foam coolers, one of the company’s best-selling online products.